On 31st March 2016, Sydenham Institute of Management Studies, Research and Entrepreneurship Education (SIMSREE) hosted the felicitation ceremony for students who participated in Aakaar. 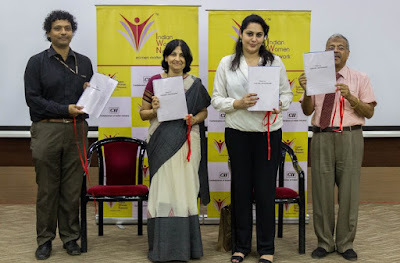 Aakaar was a NGO Mentoring session organized by the CII IWN in association with SIMSREE. The event had participation from 16 NGOs who came from Mumbai and the nearby areas including Karjat and Mahad. The Student Social Responsibility (SSR) Committee along with more than 50 student mentors from SIMSREE worked with the NGOs over the period of 1 month to ensure proper implementation of the plan suggested during the event. The Guest of Honor for the event was Ms. Mini Menon, Chairperson, CII WR Indian Women Network and Executive Editor, Bloomberg TV India. Ma’am felicitated the students for their work with the Self-Help Groups (SHGs). Ma’am also interacted with the students and gave them insights about how important it is to support people around us and be responsible. We would like to thank CII IWN for their continued guidance. This blog is awesome and keep more posting its very useful to people....! Amazing post.This is beneficial post and gives in depth information. I like to read this post because I met so many new facts about it actually.Thanks a lot. Students in MBA programs have the option of taking general business courses throughout the program or can select an area of concentration and focus approximately one-fourth of their studies in this subject. Thanks for all the information, it was very helpful I really like that you are providing information.